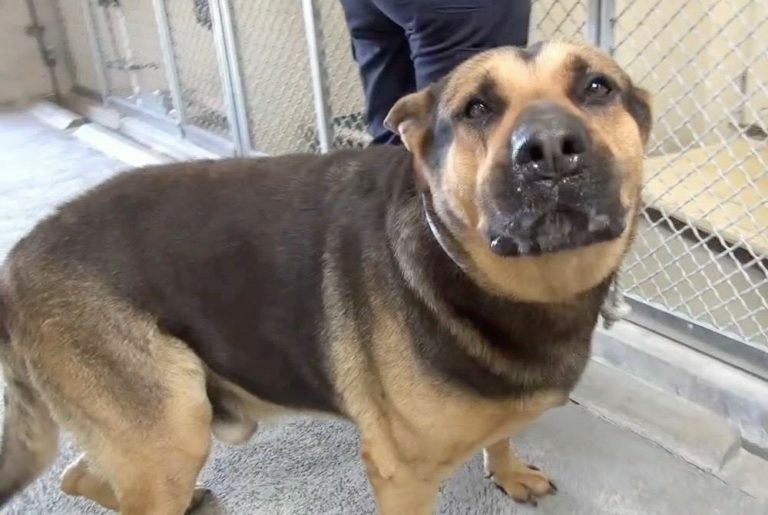 When Sampson’s owner couldn’t care for him anymore due to a “back injury,” he rounded up the 9-year-old German shepherd, instructed him to get in the car for a “ride,” and mercilessly dumped him at the notoriously high kill Carson Animal Shelter in Gardena, California. Sampson, who felt bewildered as he was confused, was surprisingly upbeat about his future and remained optimistic that something good might come out of his stay at Carson. However, as the hours turned into days, shelter patrons were none too interested in adopting the charming pup, who used to greet visitors to his kennel space with a smile and a paw. Not anymore. The pain of rejection is too much for this precious pup to emotionally bare. Sampson, who has all but given up, returns to the cold concrete slab that doubles as his bed lets out a sigh, and then cries himself to sleep hoping and wishing someone might take a chance on him. Thankfully he has you. Speak Up! if you or someone you know is interested in giving Sampson the forever family he rightfully deserves, please contact the Los Angeles County Animal Control – Carson at (310) 523-9566 and reference the shelter ID #A5053908. Additionally, please share this story on Facebook or Twitter so we are closer to finding Sampson a home. We have done it before, and can certainly do it again.